This badge earner has continued to demonstrate successful application of Risk Consulting processes and practices on complex opportunities and is perceived as a leader in the Risk Consulting space. They share their expertise and leadership within the Risk Consulting and other stakeholder communities. They have also actively mentored other Risk Consultants or have participated in special projects leading to innovation and/or improvements in Risk Consulting. Obtain two or more badges or qualifications in another relevant discipline, industry area, Service Line Method or growth initiative (e.g. Agile, Design Thinking), ideally one badge should be Advisory PM or higher. Demonstrated thought leadership either in terms of intellectual capital / assets / guides developed or represented risk thought leadership through delivering training classes; e.g. TZ/BTZ, or obtain external PM qualification such as PMI RMP. 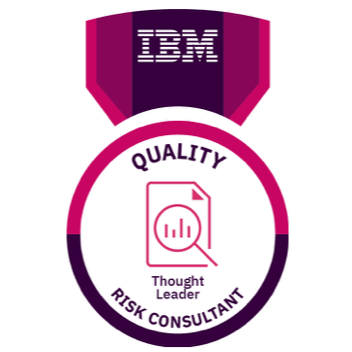 Demonstrated the ability to be considered a thought leader within Risk Management as required by the Geo Quality Leader. Badge will be issued automatically 2- 4 weeks after completion of the required education criteria and/or submission of demonstrated skills. Please see additional information in the link below.